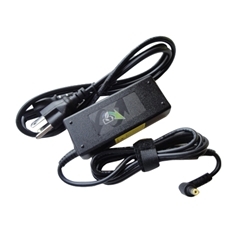 Description: New genuine Acer ac adapter charger. 65 Watt adapter with yellow tip. You will receive either a Delta, Hipro or Liteon adapter. Acer uses all three interchangeably. Input: 100-240V ~ 1.5A 50-60 Hz. Part #'s: ADP-65MH B, AP.06501.027, AP.0650A.013, AP.06503.026.